Getting ready for Christmas this year with our range of Quality BBQs which will allow you to cook he whole Christmas Dinner on. Dry brining turkey for the holidays has really gained in popularity the past couple years.Probably because of the relative ease doing it, that plus the fact that it takes up far less space. The only negative that I can come up with, is that it takes 2 to 3 days. I fell that the meat has a better texture than wet brined meat. 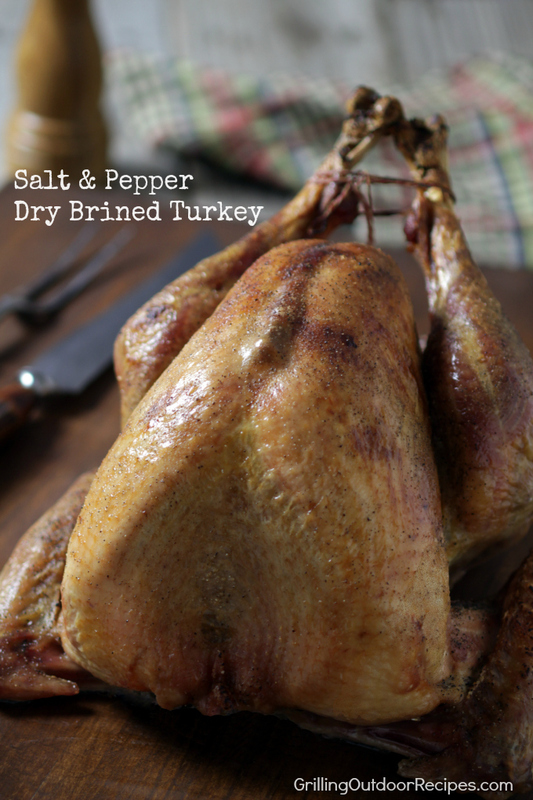 I encourage you to try dry brining – the flavor of dry brined turkey is so perfectly savory and deeply seasoned throughout every bite. Just like traditional “wet brining”, dry brining uses salt to deeply season and introduce more moisture into the meat. Contrary to what we have been led to believe, all meats benefit from a generous early salting. It won’t dry them out, trust me. Without getting too technical, it is true that the salt will initially pull the moisture from the meat. However, the effect of reverse-osmosis then pulls that flavorful moisture back into the meat seasoning it throughout. Additionally, the salt will help break down tougher muscle proteins and make the meat deliciously tender. Cook’s Note: Fresh turkey breast works the best. However, a thawed frozen turkey will do as long as it has not been enhanced with a salt solution. The added solution will make the meat too salty if also brined. Remove turkey from packaging and pat dry, inside and out, with paper towels. Combine salt, coriander, and black pepper and sprinkle a couple teaspoons of the mix over the cavity and sprinkle the remainder over the whole bird with a little extra over the breast and thighs where the meat is thicker. Wrap the tightly with plastic wrap and place in the refrigerator on a sheet pan for 2 to 3 days. Remove the turkey from the refrigerator, rinse inside and out to remove excess salt and pat dry. Set aside covered for a couple hours to take the chill off until ready to grill. Truss your turkey! Just tuck the wings under the bird, use a couple toothpicks or a small skewer to close the skin over the opening to the cavity, and tie the legs together. Trussing keeps the wings and legs close to the body and helps to prevent the meat from drying out and to ensure that your turkey will cook evenly. Plus it makes for a better presentation! Grill set up: indirect cooking over medium-low heat (300° to 350°F). Place the pan so it is not directly over any heat. Brush and oil the grates before cooking. Pour chicken stock into the drip pan. Rub oil over the turkey and sprinkle with extra coriander and black pepper. Place over the drip pan and close the grill cover. Cook until the skin is nicely browned and the juices at the thigh run clear. Timing: about 2½ to 3½ hours (12 to 15 minutes per pound). NOTE: Brined turkey will brown quickly, keep an eye on the browning once it gets to the color you'd like cover it with foil. You can always remove the foil at the end to brown a little darker, if need be. To test for doneness, the temperature of the thigh, away from the bone, should be 170°F and the breast should be between 155° to 160°F. Remember – carryover cooking will continue to raise the temperature of the turkey another 5° to 10° after it comes off the grill. Transfer turkey to carving board and tent with foil for 30 to 40 minutes before carving.